Walking across the stage and receiving a diploma is at once a small step and a giant leap for high school and college graduates. Before that happens, however, there’s usually some pomp and circumstance graduates have to sit through. Friday’s graduation ceremony at Purdue University was no different–but the bestowing of honorary degrees was something for which the whole crowd seemed excited. That’s because Purdue alumnus and NASA astronaut Andrew J. “Drew” Feustel was awarded an honorary Doctor of Science degree on the International Space Station. 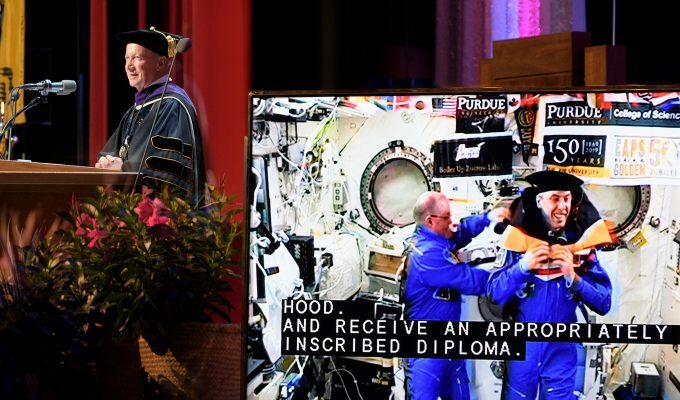 “For me, after community college, there was no other choice but Purdue–the only university I applied to hoping, and now knowing, that that decision would change my life and set me on the path to the stars,” said Feustel via live link as he floated in front of Purdue banners pinned up on the space station. Though decidedly out-of-this-world, it is rather fitting that this zero gravity ceremony was conducted by Purdue. The university is known for its impressive track record of graduating astronauts. Pick a flight from NASA’s history at random and you have a 1 in 3 chance that there was at least one Purdue grad on board. 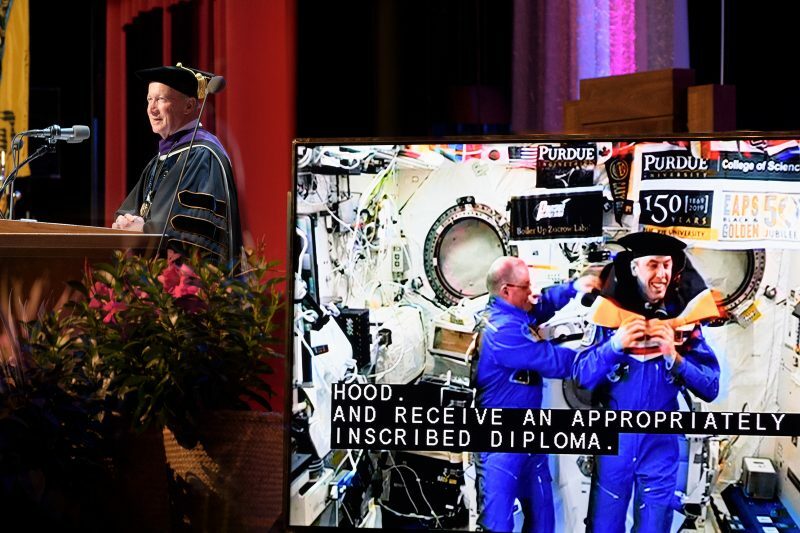 This expedition is a prime example: Feustel was joined on screen by fellow Purdue graduate and astronaut Scott Tingle, who performed the ceremonial hooding and diploma award. After a few minutes of prepared remarks and a hearty “Boiler up!” from each of them, the astronauts kicked off and floated up off screen. It’s a great moment, and it’s worth a watch if you have a few minutes. Banner image credit: Purdue University/John Underwood.